Jack Hurst was selected as Lowman Law Firm student-athlete of the week in Hernando County. Hurst shot a county best 76, at the regional tournament at Meadow Oaks. Sophomore Jack Hurst, concluded his 2017 season with a top 10 finish in the region when he shot a 76 at Meadow Oaks Golf Club. Hurst finished with the best score among the 17 golfers that participated from Hernando County. Sophomore Jack Hurst, has advanced to Regional at Meadows Oaks Golf Course on October 23rd with tee-time at 7:30. Hurst shot an 85 to place third individually. Sophomore Jack Hurst shot a personal best 38 in a match versus Central High School at Glen Lakes Country Club. Hurst had the best score against the Bears. 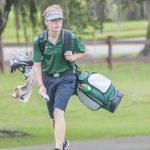 Weeki Wachee heads into the District Tournament Monday morning at Glen Lakes Country Club. Tee-Off begins at 9 AM.